- Fashion Ecstasy on 二月 1, 2019. 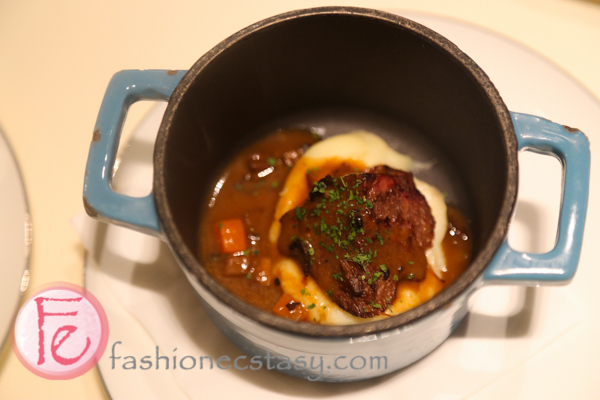 Mandarin Oriental Hotel Taipei’s Cafe Un Deux Trois has always been my favorite French restaurant in Taipei. Unfortunately, when we visited a few days ago, the restaurant has changed to an All-you-can-eat buffet-style restaurant serving international cuisine. Mandarin Oriental has always been my favorite luxury hotel and for a reason. They really upped their buffet game. A scene-stealer is Mandarin Oriental‘s impressive seafood bar; Café Un Deux Trois‘ seafood buffet area includes an extensive seafood selection featuring abalone, Sea Whelk, brown crab, mussel, red king crab, and even lobster. There is a wide selection of sauces and condiments are available for the seafood section alone. : tomato salsa, mustard, lemon, wasabi and many more. Exotic dishes in the hot food area take us on a trip around the world: duck breasts, which has gained popularity in Taiwan over the past two years are available cold with salad or hot from the “roasted duck breasts with cabbage and yuzu sauce.” Other exotic dishes include “braised Ox Tail beef with root vegetable, tomato couscous shrimp salad, “Pan-fried cod fish with lemon butter sauce, lobster seafood pie, Chinese dim-sum, and many more. Those who are looking for a taste of Taiwanese local food can find local eats like “Drunken Chicken, wood ear mushroom salad with black vinegar dressing, and Chinese preserved vegetables with scallop lips. The salad area also includes a variety of ingredients, besides the regular lettuce and veggies, there are even healthy superfood options like quinoa, which can be drizzled with luxury truffle sauce! The steak booth features freshly sliced medium-rare Angus rib eye, served in a generous portion. Mandarin Oriental definitely raised the bar for luxury hotel buffets, in addition to the dazzling buffet stations, the dining tables also come with a small menu with three chefs’ main dishes, two desserts, and coffee or tea, which are also included in the dinner fare and can be ordered unlimitedly. 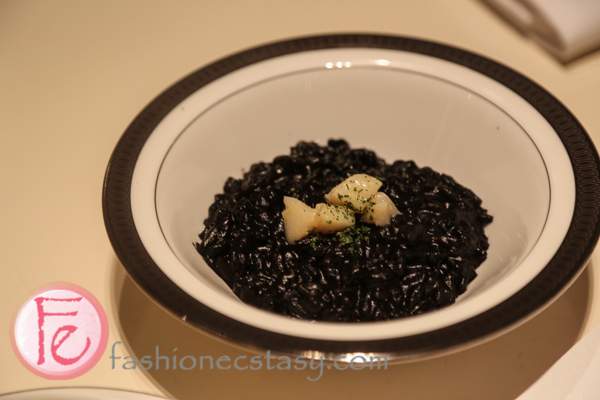 black squid ink risotto is extra creamy and topped with a scallop and herbs. Australian wagyu beef is melt-in-your-mouth tender and can be eaten without a knife, the fork alone does the job. 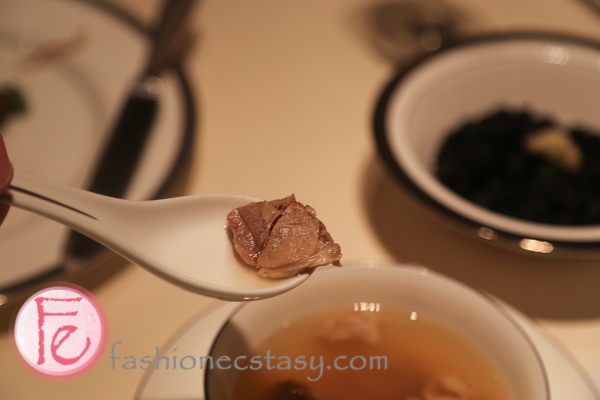 This famous Chinese soup dish is considered luxury and served on special occasions like Chinese New Years. Mandarin Oriental‘s Buddha jump over the wall is a Hong Kong-style, which means there is no shark fins or quail eggs, etc., but simply pork, pigskins, and conch, compared to the Taiwanese Buddha jump over the wall, Café Un Deux Trois’ soup is relatively light. Our dinner show for the night was Baked Alaska, which is a dessert. In addition to the show, there is a whole table of dessert buffet, so we decided to pass on the “crème Brulee, and Oolong Tea Panna Cotta included on the menu. Our favorites were the sesame pudding, tiramisu, a rich chocolate cake, matcha (green tea) cake, peanut caramel cake, mini macarons. According to the dessert chef hosting the show, this dessert （Baked Alaska) originated in France and was loved by the royalties, then promoted worldwide by a Chinese American. It is a dessert made with ice cream cake and covered with meringue. The appearance is like a snow-capped mountain and symbolizes the mountains of Alaska. The dessert is topped with flaming orange liqueur, which symbolizes the aurora lighting up Alaska. After the liqueur has been burnt, the surface caramelizes with full of citrus flavors, and the taste will become more layered. The chef recommends topping the cake with some fruity purees that are available next to it. Mandarin Oriental Hotel Taipei’s Café Un Deux Trois’ 5-star buffet does not disappoint and like its hotel, still holds a special place in my heart.